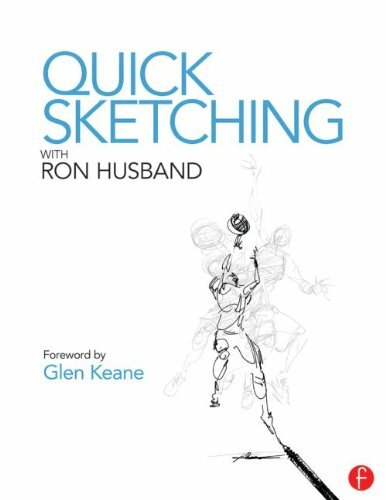 Quick Sketching with Ron Husband is essentially a book of quick tips on figure sketching. The book's goal is to get you to sketch quick, capture the moment, posture and gesture of people you see. The book collects the sketches that Disney animator Ron Husband has made over decades. They might be very loose but they still portray successfully what the character is doing simply from the body language and movement. The tips are brief yet insightful. There are suggestions on what to look out for, techniques on making your figure drawing more interesting and other useful tips. There's quite a lot of white space in the book. Not really a deal breaker, but just an observation. While the book is 408-pages, the content actually takes up only 352 pages and the rest are blank pages for you to draw on (probably at home because this is too big a book to bring out). The more you draw, the more you can draw, the better you can draw. This book is inspiring in that sense. This book reminds me very much of the two-volume set Drawn to Life: 20 Golden Years of Disney Master Classes by Walt Stanchfield which is also highly recommended.